The National Museum of African American History and Culture is a breathtaking new presence on the National Mall. Found just northeast of the Washington Monument, the museum, which opens September 24, makes accessible the almost-unimaginable journey of African Americans over the past few centuries: from the horrors of slavery, to the long fight for equality, and, finally, transcendence through spirituality, and extraordinary cultural and artistic achievements. Over 100 years in the making, the museum cost $540 million, with half of those funds raised from over 100,000 contributors. And some 40,000 Americans contributed works that will be included in the museum’s permanent collection, explained museum director Lonnie G. Bunch III at the media preview. The building itself makes a richly symbolic statement. Lead designer David Adjaye and lead architect Philip Freelon, together with their architectural team Freelon Adjaye Bond/SmithGroup, created a dramatic 200-feet-by-200-feet box, topped with a corona inspired by the “three-tiered crowns used in Yoruba art from West Africa,” where many African American slaves came from. The corona is covered in an “ornamental bronze-colored metal lattice” inspired by the ironwork created by American slaves for estates in New Orleans, Charleston, and other Southern cities. The building is well-served by a thoughtful and somewhat understated landscape by Gustafson Guthrie Nichol (GGN). Designed by Kathryn Gustafson, FASLA, and Rodrigo Abela, ASLA, the landscape treats the building as a pavilion in the broader landscape of the National Mall and aims for maximum circulation. Walking the site with Abela, he explained how visitors can find African American themes of “resilience, spirituality, and hope” symbolically represented in the landscape. 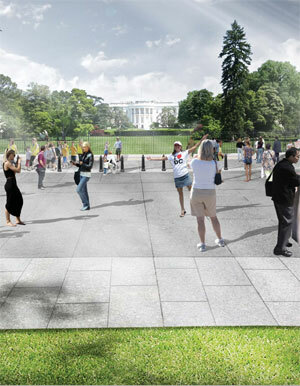 On the north side, visitors enter off Constitution Avenue, where they will see a black granite wall that provides the visual base of the site and doubles as a secure barrier. The granite wall is thick here — about 6-feet-wide — and is black to represent the canal water that once flowed through the site. Another possible interpretation of the material: African Americans’ labor is the foundation upon which was built the National Mall. Abela explained how Rugo Stone highly polished the edge of the granite so that it glimmers in the light, creating a horizon that underlines the building. As you walk up the paths on the north side, you will find they are like arms extending out in an embrace. Where the arms meet in a central point, Abela highlighted, is the place where visitors can either decide to veer right and head to the Washington Monument, or veer left and enter the building’s north entrance. Within this embrace, there’s an oculus, which shines a shaft of light into a “contemplative court” set in subterranean galleries that delve into the darkest times of slavery. “It’s a lantern, a welcoming and safe place.” As such, the landscape gently leads you up to the oculus on the surface. And near the embrace, there is a symbolic reading grove, a place where a group of school kids or a few families could gather and talk about the experience about the museum. GGN designed this grove to mimic the “brush arbors,” the community gathering places, many early slave and African American communities would create, even before they had built a church. 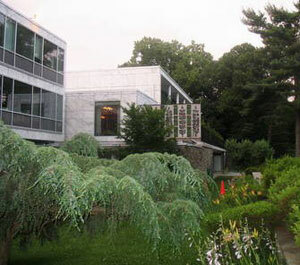 Walking along the western edge of the building, there is a lawn and rows of trees, which are reflected in the building’s wall of windows. Abela said over 100 trees were planted, including elms, oaks, beeches, magnolias, gingkos, sassafras, and cherry trees. “The Smithsonian wanted as much diversity as possible.” In coming decades, those trees will grow to enshroud the building, softening its boldness. And throughout the lawns, some 400,000 crocuses were planted. One of the first plants to bloom, they represent hope for the future. On the eastern edge of the building, there is a staircase leading down to the lower level, which is an emergency exit for the auditorium, a separate entry into a loading dock, and bicycle parking for staff. The southern entrance of the park, right off the National Mall, is where the Smithsonian expects about 70 percent of visitors will enter. There is a grand porch, another reference to African American culture, with a striking overhang providing shade over a fountain, which wasn’t working for the media preview, but will bring another cooling aspect during D.C.’s sweltering summers. Multiple paths invite visitors in from Madison Avenue. Once they pass through the gates, there is a sense of passing through a threshold into a new environment. The southern edge of the park is richer with small plants and shrubs, which form a rain garden that mute the effect of the stark black granite walls. A note on sustainability: More than half of the LEED Gold building is buried below ground, which means lower energy use. And below the structure, there are two large cisterns that collect rainwater that hits the building, so that it can be reused for irrigation. Christian Gabriel, ASLA, is the National Design Director for Landscape Architecture for the U.S. General Service Administration’s Office of Chief Architect in Washington, D.C. At the GSA he works to set design standards in the realm of public space, landscape, site security, and sustainability. He reviews and approves design proposals, serves on team selection panels, assists on special projects, and advocates for innovation. Prior to joining the GSA, he practiced as a senior design associate at Thomas Balsley Associates and Workshop: Ken Smith Landscape Architect. 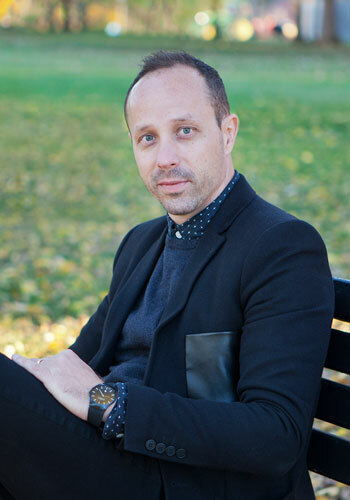 Since you began as the National Design Director for Landscape Architecture at the U.S. General Services Administration (GSA) two years ago, what has changed? 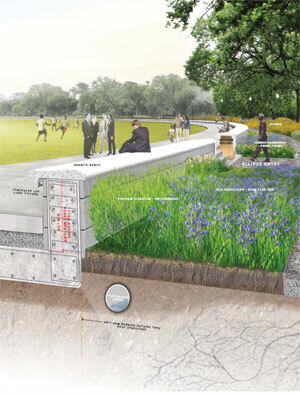 Where is GSA now on landscape architecture? In the last two years, GSA has established a landscape architecture presence that acknowledges the value of the field. When I arrived, landscape architecture issues and opportunities were addressed indirectly through other disciplines, sometimes falling through gaps between general design, architecture, art, or urban planning. But GSA wanted to shift to a more holistic approach that acknowledged the value robust landscape architectural design can bring to our projects. We have been realizing that shift through the creation of policy guidance on landscape architecture; the selection of prominent landscape architects as national design peers; identification of project opportunities, including landscape exclusive projects and ecological services; and a new landscape architecture voice in capital project design review. GSA has long-excelled at the art of sustainable building development, and now we’re beginning to bring the same attention to site design. During the past two years GSA’s new construction budget was slashed. In 2010 the budget was $800 million, but two years later that budget was down to just around $50 million. For this year though, Congress has allocated more than $500 million for some new facilities, such as the San Ysidro Point of Entry in California and an FBI complex in San Juan, Puerto Rico. What is your role in these high-profile projects? How will they showcase design excellence in landscape architecture? It’s easy to hang on the overall numbers because, like any federal agency, our budget ebbs and flows. Even when our overall capital construction budget goes down, our portfolio remains considerable since it takes quite a while to develop the large projects and programs in our pipeline. And we have a huge maintenance program to boot. Even those maintenance projects can be quite large and have the ability to catalyze change. For example, the Javits Federal Plaza project in New York City, designed by Michael Van Valkenburgh Associates, is an eloquent example of a major, well-designed work of landscape architecture that began as a waterproofing project identified and completed through our repair and alterations program. In terms of the role of landscape architecture in major projects moving forward, it will be like the role I established during leaner times: seek to be a clear-headed voice at the table, but also bring forward the value of landscape architecture in a variety of performance areas — whether it’s through ecological services or public space design. The public realm in many of our projects is vitally important. For example, the San Ysidro point of entry is one of the busiest land ports in the world. It sees 30,000 to 50,000 pedestrians every day, and 60,000 to 80,000 vehicles a day. Public spaces there see volumes you rarely find anywhere outside of Times Square. Another part of your job is educating GSA’s 12,000 plus employees who manage nearly 9,000 buildings about the value of landscape architecture. That seems like a herculean task. What is your strategy for improving awareness? 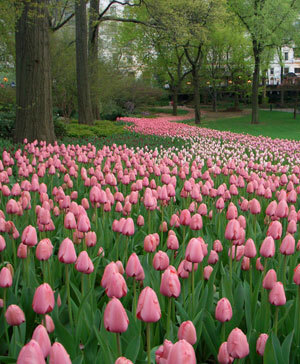 What landscape architecture issues do you think are most misunderstood there? First, you have to get to the right people. There are people at the beginning of projects who provide significant direction, like chief architect Les Shepherd who shape the look, the feel, the design team. Another critical step is working closely with our regional design and construction teams and project champions, the folks that push the projects along, ensuring that they’re meeting all of the intended objectives and aspirations of the project. Then, when the project is turn-key and facility management takes the reins on behalf of one of our client agencies, it’s critical to touch base and clarify the “care and feeding” of the projects to ensure the longevity of our landscapes and public spaces. More broadly, we’re focused on the education of all of our staff. We’re providing continuing educational units for our professional staff on a near monthly basis. Ladybird Johnson Wildflower Center and other outside institutions and practitioners provide education on landscape architecture topics. We’re also entering into the “landscape analytics” portion of our work where we’re looking at some relatively sophisticated and complex landscapes that have a lot of embedded green infrastructure and are beginning to verify the performance of those projects. Many of our staff are incredibly knowledgeable about both design and construction and have demonstrated a real interest in understanding how complex landscape projects perform under field conditions. During an ASLA-hosted webinar on how landscape architects can contract with GSA, you mentioned a short selection process that would allow local LA’s to pre-qualify for GSA projects. Can you offer any more details on this process? When you expect GSA to roll it out? We are always exploring how to enhance our contracting mechanisms and have been looking at two elements related to that: One has been the renewal of our indefinite delivery/indefinite quantity teams. The other is the potential for a short-selection process, which is really a pre-qualification for landscape specific firms. The latter element is only in a discussion stage. 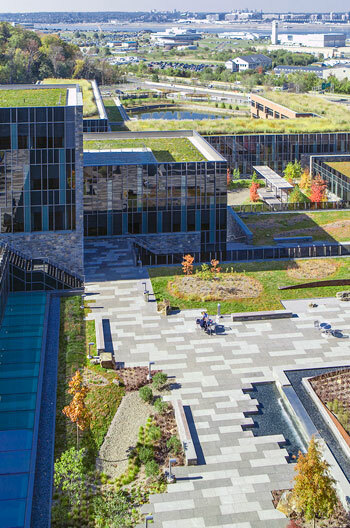 Sustainability is now a key goal for the landscapes GSA manages, but GSA must also prove the benefits of sustainable design practices like green infrastructure outweigh the costs, so it has undertaken a broad effort to collect data and make the case. What kind of data are you collecting? Are there any interesting findings so far? We’re trying to bring forward the value of landscape architecture in measurable terms. Part of that is making clear the contributions of the landscape if we’re suggesting that public money be spent on creating more intense functional landscapes to treat stormwater, sequester carbon, and produce electricity. There needs to be a commissioning process, similar to how we would commission a furnace in a building, proving to us all that it’s functioning at a certain capacity. Often green infrastructure is assumed to be functioning at maximum capacity. We know in practice, however, that it’s actually very rare, because these are living systems not typically maintained at a perfect level or performing at a consistent level. First is the new United States Coast Guard headquarters at the old Saint Elizabeth’s Hospital site in Washington, D.C. It is a massive structure, set against a hillside in an historic campus, which hosts the third largest green roof in the world. The combination of on-grade and on-structure elements working together to provide diverse ecological services and zones for the overall project is astounding. We’re planning to verify the performance of hydrologic networks and other sustainable features through a combination of on-site and secondary research, examining the construction, installation, and care. Second is the Domenici Courthouse in Albuquerque designed by Rios Clementi Hale Studios. This is a SITES-certified project, on a much smaller scale, and in a totally different eco-region, demonstrating an entirely different approach to sustainable landscape. The two projects should prove complementary. Carbon, water, and electricity are the three defining design issues of our day. We’re hoping to tackle two of them within the realm of landscape. We are not alone in our interest: Our colleagues at Andropogon Associates, lead designers of the United States Coast Guard Headquarters landscape, have started similar research on other non-federal facilities. We’ve also recently been in touch with Reed Hilderbrand, a firm also looking at something similar, essentially a commissioning process for their Clark Institute of Art project in western Massachusetts. Your work must incorporate security. Is there a new approach from GSA for using the landscape to improve security? You were talking about these point-of-entry projects where security needs to be visible. You need to know you’re entering this secure environment, so there are symbols of security. But how do you balance creating a sense of security while also providing access and transparency? There is the issue of preemptive security, the visual definition of security, so people understand a legible and secure envelope on a building or site as a deterrent. That is of great interest to our security-minded client agencies. At this point, nearly all federal client agencies essentially self-identify the risk level of their own facility on a pre-defined scale. The Interagency Security Council develops all the standards and protocols, the hardening requirements of each level facility, if you will. So this issue is deceptively complex. Regardless of the risk level however, the best path is integrated design. 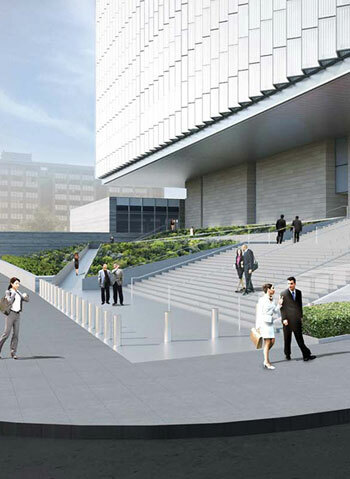 For example, the Los Angeles Courthouse, now in design and construction on a highly urban site, has a series of walls, planters, and bollards. It’s the idiosyncratic deployment of those things, not in a singular, monolithic monotony that make it less pointed. That site was designed by Mia Lehrer + Associates and peer reviewed by Jennifer Guthrie, ASLA. By contrast, at the federal campus down in Puerto Rico, where we have more real estate, we can explore more use of tactical topography and water courses as security devices. Lastly, with colony collapse disorder, honey bees and other crucial pollinators are dying off in great numbers. They are being affected to such an extent that President Obama has issued a memorandum to use buildings and landscapes managed by GSA and other federal agencies to help these important insects. What is GSA specifically doing to help honey bees and other pollinators? How are you going to measure progress? Pollinators contribute more than $25 billion in value to the American economy every year. Some 60 percent of pollinator populations have been significantly reduced, or have disappeared completely, in the United States, over the past 60 years. Some estimate that 40 to 50 percent of our food would not be available without pollination. Now, we put an economic value on these creatures, but, clearly, they’re irreplaceable. GSA provides an enormous educational opportunity because we are responsible for office space for 1.2 million federal workers every day. Through our facilities, we have the ability to touch people’s daily lives about this issue while also providing an ecological service. We’re interested in providing both habitat and foraging opportunities for pollinators; it’s in the realm of what can do through design as an agency. GSA is not one of the big land agencies. We’re not the Department of Interior, Department of Agriculture, or the Forestry Service, but many of our facilities occupy an important part of the built environment. If you follow Richard Foreman’s theory of land mosaics, our facilities can be considered critical stepping stones for pollinators to move from one site to another. Our urban and ex-urban landscapes are fragmented and we can do our part to improve the conditions for pollinators. For design and construction, we have a facility standard that guides our process — essentially setting the minimum of what we’re trying to achieve across the board for design performance. Now we have a baseline standard for plant diversity that attempts to provide foraging opportunities for pollinators throughout the year and can be applied across the nation for projects of varying size. There may be exceptions because we’re writing a standard for Phoenix, Arizona and Portland, Maine at the same time, but it gives us the opportunity to force an issue as critical as pollination up to the front in design considerations. We can ask our design teams to think critically about pollinators as it relates to a design and then allow a discussion to emerge. GSA also worked closely with the White House Council on Environmental Quality, White House Office for Science and Technology Policy, Smithsonian Gardens, the U.S. Botanic Gardens, and other federal partners on writing the new addendum to federal landscape guidelines to support the health of honeybees and other pollinators. 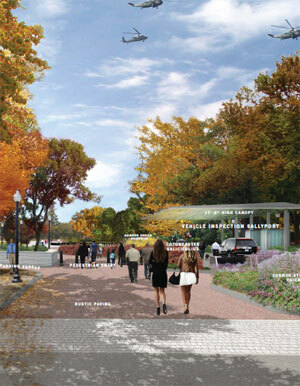 Today, the National Capital Planning Commission (NCPC) announced Rogers Marvel Architects has won a design competition for a new President’s Park South, a 52-acre historic site located between the White House grounds and the Washington Monument. Redesigning President’s Park South, which is one of the most-visited landscapes in Washington, D.C., is a challenging brief for a designer. The site, which includes Sherman Park and the Ellipse, a number of monuments, and a closed through-street (E Street NW), is home to the national Christmas tree and also filled with tourists, local joggers, and sports teams year round. 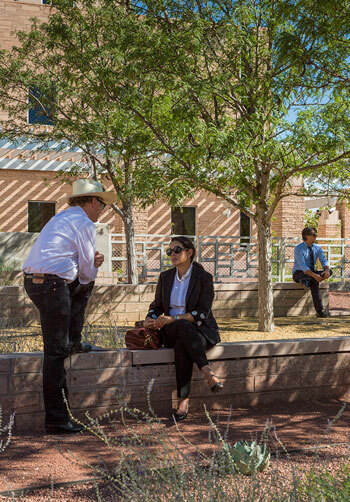 Any new design must meet the tough security requirements of the U.S. Secret Service but be more easily accessible for the thousands of tourists and locals who use the space. In addition, a new design must accomodate both bicyclists and those driving into work at the White House every day, and offer an “attractive environment” for visitors while maintaining the site’s “historic integrity.” Alex Krieger, a professor at Harvard Graduate School of Design and an advisor to the competition, said “it’s a challenging, intriguing project” with issues that only “some of the most creative minds in the field of design” can solve. 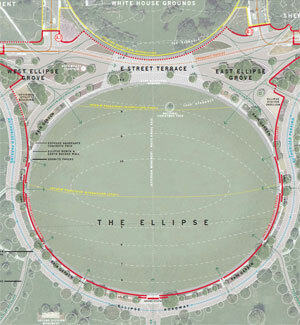 The Ellipse’s lawn would be replaced with super robust “turf grass” so it would function like Sheep’s Meadow or the Great Lawn in NYC’s Central Park. “It would be designed for heavy use.” Rogers would also add a formal paved promenade all the way around the Ellipse to provide easy access for strollers. Managed parking would be kept in place but new “native-planted, vegetative swales” would be set within walkways between the new promenade and parking spaces. The grade of the Ellipse would be subtly regraded to camoflauge the views of the cars from some viewpoints. Interestingly, Rogers would move the security barriers to the far south end of the Ellipse, enclosing the entire park in a new set of security measures. Perhaps there’s one downside though: it cuts the Ellipse off from the Washington Monument, severing the freeflow of people between the sites. Reed Hilderbrand Associates: Gary Hilderbrand, FASLA, said President’s Park South is an “open space that symbolizes American democracy,” but has been plagued in recent years by barriers. As a result, the visitor experience is highly frustrating: “People don’t understand why they can’t get a view.” To remedy the lack of access and maintain the security, his team’s proposal would rely on a system of bollards and “existing historic fences” to create sets of zones that can be secured. A new pedestrian plaza would appear where the southern end of the White House grounds meets the top of the Ellipse, the “pinch point” that causes so many problems now. E street would be open to pedestrian and bike traffic but the system of sallyports to check cars would remain in place. During Q&A, NCPC members zoomed in on the bollards. Harriet Tregoning, director of D.C.’s planning department, wondered if bollards are the way to go given there are new security measures that can be built into the landscape like granite benches or curves. Other NCPC members wondered how “procurable” the elements were if they needed to be replaced after a bomb attack. Sasaki Associates: Alan Ward, FASLA, sees an opportunity to “reconnect the White House to the city and reconnect the Ellipse to the city” through a “simple and economical design.” Ward would move the sallyports up north and open up E street to pedestrians and bicyclists. On a new E street, only limited car traffic would still be allowed. A long narrow wall that also act as seating would provide a new security barrier along the northern end of the Ellipse, offering a “usable edge and security within the design.” In front of this bench-wall would be a “significant plaza space” in the center of E street, which would open up the park for visitors angling for photos. Additional seating areas on the side would enable pedestrians to stroll and relax, while a new cafe would also be added in one of the shaded, tree-covered side groves. Within the revamped E street zone there would be a separate bicycle lane driving through east to west. For views, Ward proposed “subtle grading changes” to block views of parked cars along the southern ends. A stage for event space would also be created with a lawn with seating. Tregoning wondered if a delineated bicycle lane was the best idea. She found the idea “hazardous” and called for a blended space where bicyclists and pedestrians would have to navigate more carefully, like a Dutch woonerf. Other NCPC members wondered about the “purposeful geometry of the paving” and whether it’s necessary to create pathways with different styles. 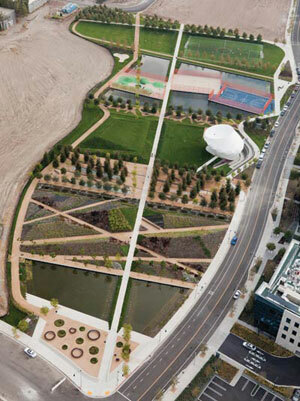 Hood Design Studio: Walter Hood, ASLA, recent winner of the National Design Award, thinks President’s Park South is a “hybrid landscape” because it “has to do many things for many people,” namely serve as a residence, public recreation site, and forum for democratic expression. It’s also a “palimpsest,” something that can be wiped clean and used again. In that vein, Hood proposed “moving forward towards a new future a new place” that would reference earlier designs by Andrew Jackson Downing but also feature “articulated urban spaces” and ha-ha walls to offer subtle security measures. Hood emphasized the need for “squares” at either end of E street along with “garden circuits” that would tie together the landscape and paths. Van Valkenburgh, who seems to have been through the ropes before with the Pennsylvania Avenue re-do, left some design elements open to discussion. He said that “the materiality is very sensitive” and he’s open to being “flexible.” This may be smart given he said First Lady Laura Bush didn’t like any of the pavements he chose for Pennsylvania Avenue, so these were all changed during that project’s design process. On the overall process and next steps: the National Park Service led an inter-agency process that resulted in a “Comprehensive Design Plan for the White House and President’s Park,” which created a vision for updating this historic landscape. According to NCPC, the winning design will go on to “inform the development of alternatives” for the new park, which will then be completed through a larger process run by the National Park Service and the U.S. Secret Service. Any ideas from the five finalists’ proposals could be included. These final designs will be reviewed through a “federal and local review and approval process,” which also includes an environmental assessment, over the course of the year. Read the article to learn about how other architects and landscape architects cross disciplinary boundaries. In a study recently published in the peer-reviewed journal, PloS ONE, the plant reseachers say they are focused on how “computationally re-designed periplasmic binding proteins (PBPs) provide a means to design highly sensitive and specific ligand sensing capabilities in receptors. Input from these proteins can be linked to gene expression through histidine kinase (HK) mediated signaling.” They are in fact manipulating the chemical reactions of plants so their leaves are designed to “drain off chlorophyll” when bomb chemicals are detected. Without chlorophyll, plants turn a much lighter shade. June Medford, a a professor of biology at Colorado State, says the color change must be dramatic if plants are going to work as an early detection system. Read the article and see the research study. “Washington, D.C. exudes grandeur and there is a clear link between politics and architecture in the city,” said the Crown Prince. So, in D.C., embassies must also convey values. In the past, embassies were used to convey wealth and power. Increasingly, though, embassies must convey the contemporary, cultural side of countries. The former U.S. Ambassador to Denmark, Richard N. Swett, one of the few architects to ever serve as a member of Congress, added that Denmark is also one of the only countries to successfully integrate best practice design into society. The Danish parliament includes a design review committee, which reviews all pending legislation to ensure it “improves the quality of life for all Danes” and has the broadest impact on society. Swett said Denmark is a model for how to integrate design into national policy. A focus on security in the U.S.
Jane Loeffler, author of “The Architecture of Diplomacy: Building America’s Embassies,” gave an overview of the design philosophy behind U.S. embassies. Prior to the 1950’s, U.S. embassies were built in grand old mansions, as the Danish Crown Prince explained. Then, starting in the 1950’s, the State department’s foreign building office, which was led by a “committed modernist,” began building open, approachable sites. Eero Saarinen’s embassy in London is a key example of this era of U.S. embassies. Still, there remain some exceptions. Panama City’s new embassy may be a fortress but at least it’s LEED-certified. In Beijing and Berlin, the embassies were designed by well-known architects. The embassy in Beijing also features the “art in embassies” program. 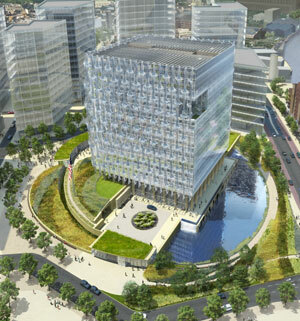 London’s new embassy by Kieren Timberlake / OLIN will be the first under the new design excellence program. Unlike the old Saarinen embassy, which neighbors complained was “a hazard in our midst,” the new embassy will be better insulated from the surrounding neighborhood. The new OLIN-designed landscape is the first to embed security features into landscape architecture; bioswales double as blast walls (see earlier post). Image credit: Danish Embassy, Washington, D.C.
“At ground level, the architects, working with landscape architect Laurie Olin, have tried to engage the neighborhood despite security guidelines that require the building to sit back within a circular zone of blast protection. 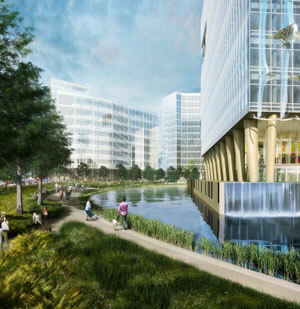 A park will wind like a corkscrew from the riverfront onto the embassy grounds and into the building itself, which will feature a number of interior sky gardens, including a two-level Ambassador’s Garden on the upper floors. A formal plaza leading to an entrance for embassy employees and dignitaries faces east, and the general public will enter through a curving path lined on both sides by greenery. 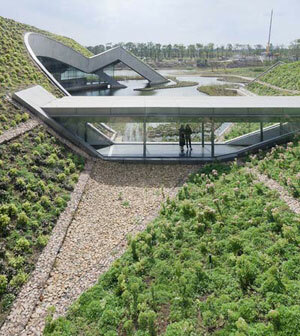 “The building is surrounded by an elaborate landscape that reaches out to the surrounding city. A semicircular pond borders the structure on one side, and terraced meadows wrap around the other. Pathways running alongside the meadows would connect the site to a proposed public promenade (part of the city’s plans for the development zone). A narrow park runs between the pond and Nine Elms Lane, the main approach from the Vauxhall tube station. Conceptually, the landscape continues right up through the building, with a series of terraces carved into the facade. The abundance of green space contributes to the design’s environmentally friendly image. Circuitous paths weave through the park, which in renderings is full of young professionals. 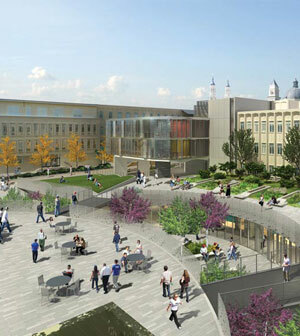 The main entry plaza for the building, which extends along the edge of the pond before slipping under one side of the colonnade, is conceived as a lively public space. “Rather than employing a plinth to accommodate the large programs located at the lowest levels of the building, the colonnade sits atop a gently rising earthen mound. Within this landscape form are parking garage ramps and basement service and mechanical areas to the south, and the lower level of the Gallery and Multi-Purpose Meeting Space to the north and west. Instead of fragmenting the embassy into a plinth and tower, this strategy transforms the large footprints of the lower levels along with the entrance pavilions into earthen landscape form to enhance the prominence of the embassy colonnade and transparent building. The visual presence of the whole is that of a beacon that is a respectful icon representing the strength of the U.S.-U.K. relationship. The ground breaking for the Embassy is expected in 2013 and construction will be completed in 2017. The 12-story green building, which will feature glass, photovoltaic film-laminated ETFE scrim walls, rooftop solar panels, and biomass generators, as well as the site’s landscape architecture, is expected to cost some $500 million in total, writes Bloomberg News. In addition to KieranTimberlake and OLIN, members of the winning team include Arup for Sustainability, MEP/FP and Civil Engineering; Weidlinger Associates for Structural and Blast Engineering; Gensler for workplace design; Davis Langdon for Cost Consulting; and Sako & Associates for Technical Security. OLIN partners Hallie Boyce and Laurie Olin, FASLA, will lead the landscape project. Learn more about Laurie Olin, FASLA, and his work in this in-depth interview.